First, What Is A Dashboard Camera? A dashboard camera or ‘dash cam’ as it is most commonly called is a device that is fitted in the front of the vehicle. The dash cam is usually fixed to the top of the windshield where it is discreet and can’t really be seen. However you can also put them on the dashboard, a little more obvious but still does the job. There’s so many benefits to owning a dash cam but this is the main reason people buy theirs in the first place. Having a dashboard camera with you at all times when you are driving is pretty much like having an eye witness with you at all times. A dash cam helps insurance companies decide who is at fault almost immediately, there’s none of that waiting around waiting for someone to admit liability, the proof is right there on video! I’ll be honest, this isn’t really a benefit you would think about, or a reason why you would buy a dash cam. However, knowing you are being filmed (even if it is by yourself!) naturally makes you more cautious; because if you were to have any accident or send any footage away, the last thing you would want to be doing is driving like a lunatic on it do you? With more and more people purchasing these devices, we at Whatcarcamera honestly believe that one day owning a dash cam will be a requirement for most insurance companies. 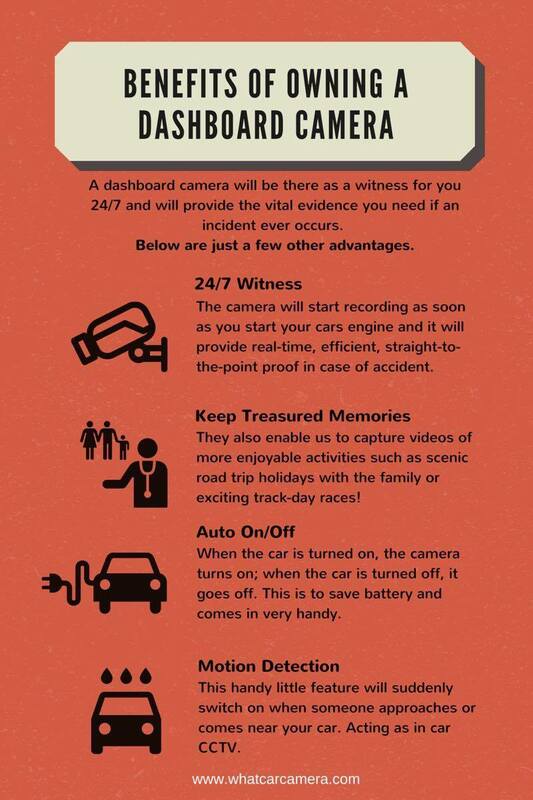 Below is an infographic listing more reasons why owning a dash cam is beneficial.